Castellare is a small farm in the high hills near Florence. at one time, a small community of nuns lived here. In the large meadow a swimming pool is at our guest's disposal. away completely, yet are unwilling to go without modern conveniences. Castellare is an ancient building complex on the high hills that surround Florence (just 20km away). It is set on top of a private hill, invisible from the public street, and completely surrounded by nature. We offer four accommodations, warm and inspiring, and a swimming pool is in the main lawn. The Stalla is our larger accommodation and is displayed on two floors. Upstairs two spacious bedrooms (a double and a triple) and a bathroom; downstairs a big open space with a fully equipped kitchen and a comfortable livingroom area. The Stalla house is perfect for a family or a small group of friends. In restructuring it we tried to maintain its rustic and antique charme, so you will find an original stone floor and family pieces of furniture. Outside the livingroom door there is a private garden with table and chairs of wood. The Loggia has an independent kitchen with a pretty view, a livingroom, a bathroom, and a bedroom on a loft under a roof of old beams. There's a private patio with table and chairs just outside the kitchen's door. The Stalletta is a charming small accommodation with a bedroom, a spacious bathroom, and a room with a kitchen, a dining area, and a lovely relaxing area with a sofa (that can be used as a day bed) that has been custom made with parts of antique wood. Just outside there is a private little garden with table and chairs and a stone barbeque. The Capanna is a small cottage of stone, with a bedroom, a bathroom, and a room with a kitchen a livingroom and a dining area. It's walls have been maintained in stone on the inside too, whitewashed to give more light and brightness. This retreat too has a small private patio with table and chairs. All accommodations have sofabeds for one or two extra people to be welcomed. We also have cots and high chairs for babies, at guests disposal. For a few years we had an etching workshop on the premises, and we have enjoyed the experience of welcoming artists for long stretches of time. Writers too embraced the inspiring nature of Castellare to come and work on their writing projects. This is why, although we have moved the etching workshop to another location, we still have special rates in the winter for those who wish to come and dedicate themself to art; may it be writing, painting, or even the exploration of oneself. Many of the pieces of art you will see in the houses have been produced here. My name is Catina, and my family and I (my partner and my son) also live on the spot. This property was bought by my grandparents, and it has always been a holiday home for family and friends while I was growing up. I have been the first permanent resident though, for now almost twenty years, and I adore living immersed in nature in close proximity with the wildlife. Expecially deers. The restructuration of the house took some time during which I started really enjoying all things "home", from furniture to textiles to ceramics. Offering guests a holiday retreat with the warmth and care of a home , in the peace of nature, has become a passion as well as my job. Castellare's unique feature is it's location, completly sorrounded by nature. A driveway of about 700 meters connects the buildings to the main road, a charming winding street called Via di Parga with some breathtaking views. Then the driveway in the woods, where one feels the strains of contemporary life stay behind as the transformative power of nature takes over. Every time I come back from the center and the driving in traffic , I feel restored. The house appears after the last curve as the most cherished retreat, a place where I have always felt welcomed, from the day I moved in, and it was just the cat and I. Although Castellare really conveys the feeling of being out of time, the neaby village of Molino del Piano (about 5 km away , downhill), embraced me like family. The people have something magical about them, as they are open and friendly and kind, and we easily bonded. To try and participate to local life, like going sometimes for breakfast or a coffee at the local bar ("bar" in Italian is a caffetteria), play tennis in the village courts, or even try the weekly appointment at the free cinema, may give a glimpse to what it means to live in the area. It's a life of simple pleasures, lots of smiles, friendship and all the inspiration one can wish for in perfect reach, may it be the opera , art to last for a lifetime of awe, the discovery of surprising corners of nature, the wandering in one of the most beautiful regions of Italy. The benefit I try to offer guests if the comfort of a cozy home, where it's a joy to return to after a day of adventures. I like that we are small, with just four accommodations. It's not luxury that I love, but the uniqueness of handmade things, silence, and the stories of people from the world. There are many mega resorts in Tuscany, but very few settings like this, unspoilt, and a bit magic. 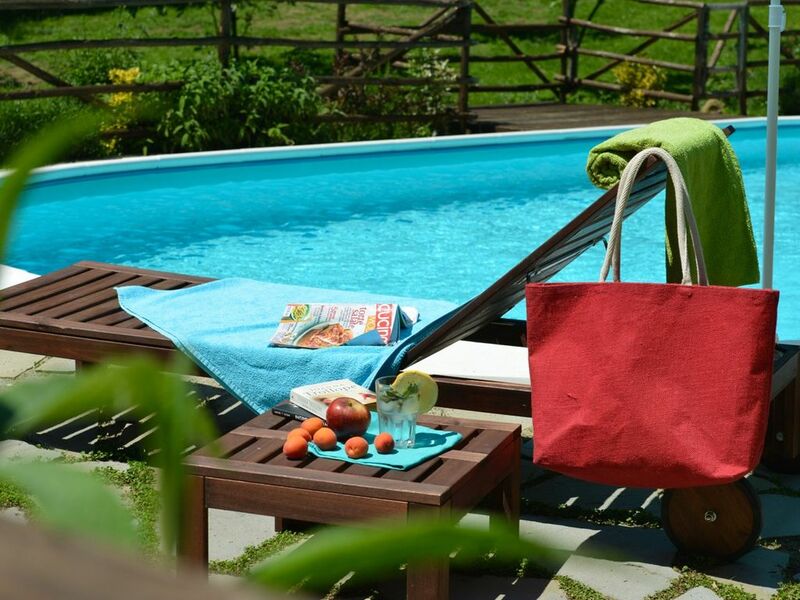 There is a swimming pool for the exclusive use of Castellare's guests, on the main lawn, sorrounded by the woods.. It is gorgeous and homey. A stunning place in the country, while being closes to the city. The owner, Catina, is the most amazing of women, and I am so grateful to have met her. She has created an oasis for herself, and others. Her partner, Jack, greeted us, and he was very helpful and generous. He made us a homemade Tiramisu. This property is just stunning. I loved the pool. I swam in it many times. I loved the house, it was so peaceful. So many books to read. I found a good one. All the houses on this property are beautiful. I wanted to stay in all of them. I, picked the biggest one, for my friend and me to share. The road to get up to the place is pretty rocky, so, I am glad I had a good car. Most of the roads in Italy are pretty tight, and twisty, so, it isn't unusual. The drive up to the place is worth it for the magnificent views. I am so happy I chose Catina's place. I had a holiday to treasure. I would pick this place again, in a heartbeat. Thank you Catina and Jack, for providing me with such a great experience. You are in my heart forever. You will be so glad to stay here and to meet Catina! The photos give an accurate picture of the beauty and peacefulness of this wonderful property. This estate is an escape from the hurly burly of the world. We were very happy with all that was provided. The pool was wonderful, looking over a fruit tree orchard and surrounded by plantings that attracted butterflies. Catina, our hostess, was a delightful person to meet and she recommended, local grocery stores, wines shops and restaurants which were all excellent. We were away from the classic tourist sites and really in Italy with the local people. We had wonderful experiences that were not of the typical tourist visit. Great food, wine, and wonderful local people. The location is very convenient to many places a visitor would want to see and the train was very easy to navigate and we went into Florence several times (20min ride) and explored wonderful nearby hilltop villages and towns, we were transported to a different time and pace of life. I understand completely why visitors to Castellare decide that they have to return. We stayed in Catina's Castallere for two weeks in July and could not have been happier that we did so. We rented the Stalla, Stalletta, and Capanna, and when we were all present there was 11 of us. Firstly, Catina is the most wonderful host; she truly goes above and beyond to make her guests feel welcome. She is such a kind, warm person -- I immediately felt like I wanted to be her friend lol. She is very attentive to every need, and truly went above and beyond to make our stay enjoyable and easy. She is just such a genuine, compassionate, and welcoming person, and it was our whole group's consensus that she made our stay unforgettable. The property itself is remarkably stunning. It is about a 15-20 minute drive from the Sieci train station, and it essentially all uphill -- you really climb a mountain. It is so quiet, and so peaceful -- such a nice break from the busy-ness of Florence. In fact, one of the most memorable days of our vacation was when we all stayed home and napped and swam and ate and napped and swam some more; the place engenders relaxation, and we ended up spending a lot more time at the house than I thought. There are a few towns within short driving distance from the house, and also a cooking school where we did a lesson -- a lot of fun. It's a relatively easy half hour drive to a huge supermarket, and a much shorter drive to a smaller market in Molina del Piano. Catina had a binder of information at the house that was very useful -- we consulted it a number of times. Overall, I will definately be back to this place -- just a lovely retreat -- perfect for relaxing and enjoying the stunning beauty of Tuscany. There are not enough words to describe the Paradise of this Place.... First of all, the owner its a wonderful and very familiar person, called Catina. She is always there to help you in anything you need, and shows you the really way of Tuscan people living. We are a young couple of Spain, that used to go there every year, because there you can relaxed and disconnect of everything. The apartments are full equipped, with all the details you can imagine in Tuscan design. When you arrive to the apartment, a very good surprise is waiting for you there....a home made cake done from Catina that welcomes you in the great Tuscan cuisine!!! Also the surrounding of the property is fascinating with a swimming pool and a very cared garden full with flowers and plants. Its really a secret Paradise in the Tuscan forest ideal for families or for couples. Florence is near - but far away enough to make ist possible to appreciate the peaceful place at Molino del Piano. The farmhouse is furnished so tastefully, there are gas cookers so the meals we cooked tasted so well and last but not least the warmhearted and kind personality of the host made us fell in love with the place. We recommend the ancient farmhouse and we love to come back next year. The Castellare farmhouse is set in private woods between the tiny villages of Doccia and Fornello, fractions of Molino del Piano, Pontassieve county, in the Florence province. Although it's in a very private spot, it takes minutes to arrive to the closes restaurant and grocery store, and less than a half an hour to get in the centre of Florence. There's also a very convenient train station, in Sieci, 6 km away from Castellare. In a short drive you can get there, park your car safely and for free, and take a commuter train to the centre of Florence. It only takes 15 minutes, and trains are very frequent. There are two horse riding places within a ten minute drive, two golf course within a 25 minute drive, and tennis camps in Molino del Piano. All major cities of Tuscany are within an hour drive, and you could even go to the beach, swim in the sea and come back in a morning. The price is for a occupancy of 10 people in three different units: the Stalla house (4), the Loggia house (2), the Stalletta house, and the Capanna house (2). Castellare can sleep a maximum of 13 people using the sofa beds, and for each extra person we ask for €10 per day. Price includes: linen, towels, all utilities, taxes and final cleaning. A 50% deposit is requested at the moment of reservation. Deposit is refunded in case of cancellation, with at least 90 days of advanced notice.